The kit represents the early tail and fillet which is incorrect for a Red Arrows Hawk. This resin part more accurately portrays the later tail and adds detail missing from the kit parts. Cut fuselage before assembly as shown in the drawing above (best to cut slightly oversize and file/sand to size, checking the fit of the resin part as you go). 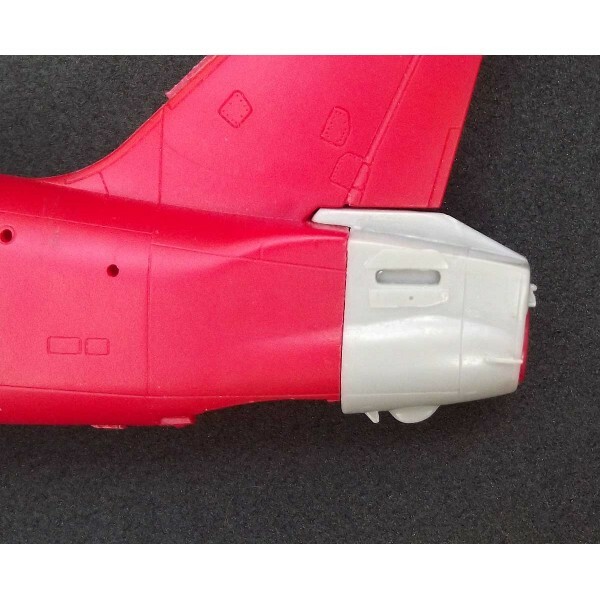 Remove casting lug from the resin part, assemble fuselage halves including the tail pipe, slide the resin part in place and glue with epoxy or cyanoacrylate. Some filling may be required depending on how accurate your cuts are. The tabs on the horizontal stabs will need to be trimmed to fit. Smoke tubes can be added from fine wire if desired. Note that the trailing edges on the Revell wings, stabs and rudder are grossly oversized and should be thinned for best results.